SEJONG -- The atmosphere on the streets at year-end was not the same in 2018 as what people remembered from past years. To explain it, they pointed to the large number of struggling small business owners amid a sagging economy burdened by weak private consumption. Another barometer of consumption during a short period is the Lunar New Year holidays, which fall Feb. 2-6 this year, a time on which many industries are pinning their hopes. One question is whether Chinese tourists will visit South Korea in large numbers and engage in mass consumption on the occasion of that country’s Lunar New Year holiday, called Chunjie, which runs Feb. 4-10. 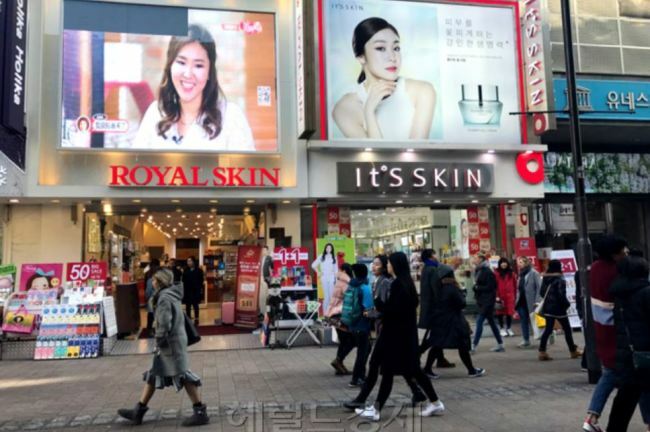 Cosmetics retailers in Seoul, Jeju and other major cities have suffered a drastic drop in sales over the past few years in the wake of political controversy between Seoul and Beijing over the Terminal High Altitude Area Defense anti-missile system. The government projected that about 80,000 to 92,000 Chinese would visit the nation in early February. Other business areas such as tourism, lodging and air travel are also expected to see a rebound now that disputes between the two countries have died down somewhat. Experts representing both the private and public sectors share the view that Koreans’ consumption is a bigger issue. “It is undeniable that consumption by local households and inbound tourists will grow thanks to the Lunar New Year. But this is not a stable remedy,” said one official with a state-funded agency. 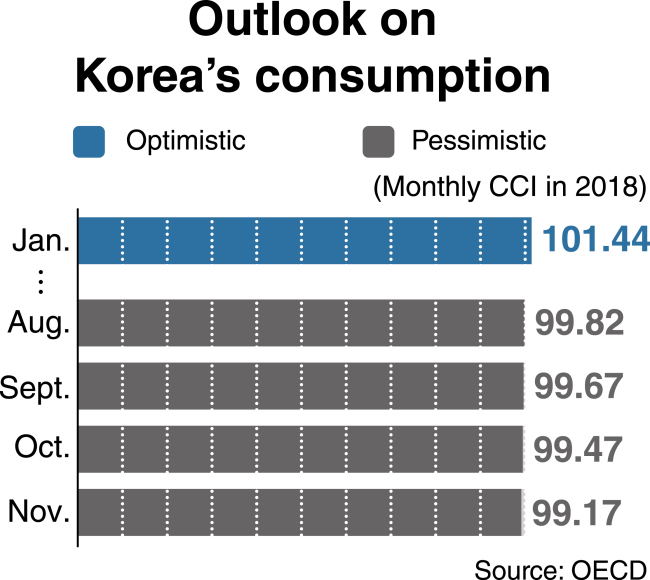 Korea’s consumer confidence index for the first half of 2019 stood at 99.17, the lowest among the 27 members. Any reading below 100 indicates that pessimists projecting an economic downturn outnumber optimists expecting greater economic vitalization. The index illustrates projected household spending trends six months into the future. “The figure is comparable to what it was 10 years ago, when Korea’s consumption sentiment was the brightest among (then 30) OECD member countries,” said the official. In August 2009, Korea’s CCI posted 104.2. For 2018, the CCI peaked in January at 101.44. But the figure fell below 100 to 99.82 in August and stayed there, posting 99.67 in September and 99.47 in October. A recent survey from the Korea Agro-Fisheries and Food Trade Corp. showed that households cut back on eating out in 2018, compared with the previous year. The OECD report also indicated that Korean business sentiment had sunk to one of the lowest levels seen in any member nation. The country’s business confidence index for the first half of 2019 stood at 98.42, placing Korea at No. 26 out of the surveyed 27 nations. Kim reportedly said economic indices might further worsen in tandem with continued difficulties in the real estate market and the semiconductor industry.